Access to accurate and useful climate-related information is a prerequisite for smallholder farmers to use and benefit from climate services with respect to both agricultural and livelihood decision-making. Whether or not farmers access particular climate-related information products is determined by the types of information products that the national meteorological service and other providers make available, by access to the communication channels used to disseminate information, and by demand for the information. Gender-based factors can influence differing access to communication channels for women and men. The present brief highlights some of these key challenges to achieving socially inclusive access to weather and climate information, and presents promising pathways for developing gender-sensitive communication channels in climate services. Gumucio T, Hansen J, Huyer S, van Huysen T, Schwager S. 2018. 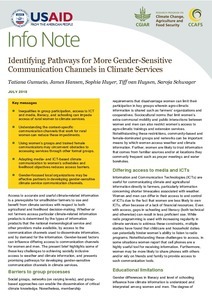 Identifying Pathways for More Gender-Sensitive Communication Channels in Climate Services. CCAFS Info Note. Wageningen, Netherlands: CGIAR Research Program on Climate Change, Agriculture and Food Security (CCAFS).